In the summer 2017 my wife and I furnished our bedroom with new furniture. The new wardrobe has now LED lightning and the bed has also lightning integrated. But the bed has only one switch for the two LED’s. Switching the LED right and left separately was not possible and switch the wardrobe LED’s off while in bed was not possible. I doesn’t want a simple solution. I want something switchable with the smartphones. 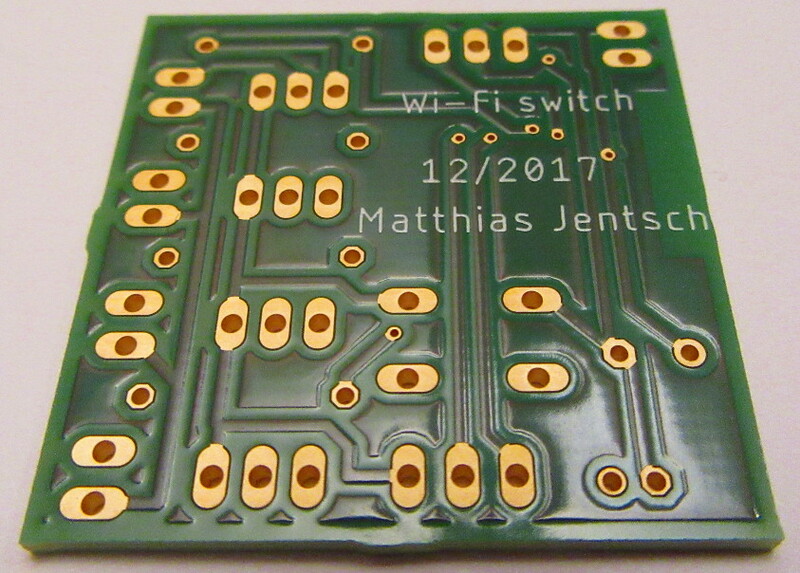 Because I’ve experience with the ESP8266 from my water level gauge I decide to build a switch for smartphones. I want make use of the MQTT protocol. 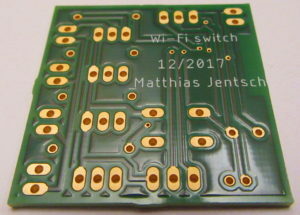 It’s lightweight enough to implement into a small device like the ESP8266. The LED’s are supplied via a 12 volt transformer. The ESp8266 needs 3.3 volts. So I decided to use a LF33CV for a stable 3.3 volts supply. 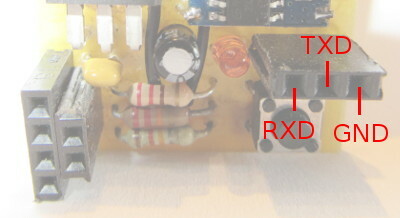 For switching the LED’s I use a BD237 transistor. 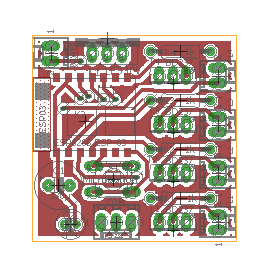 From this schematics I’ve designed a small double layer PCB. 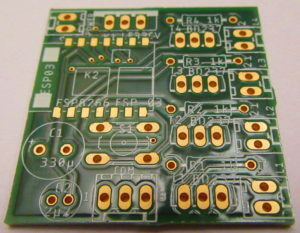 I’ve ordered three PCB on aisler.net and after a few day I had three professional manufactured PCB’s in hand. 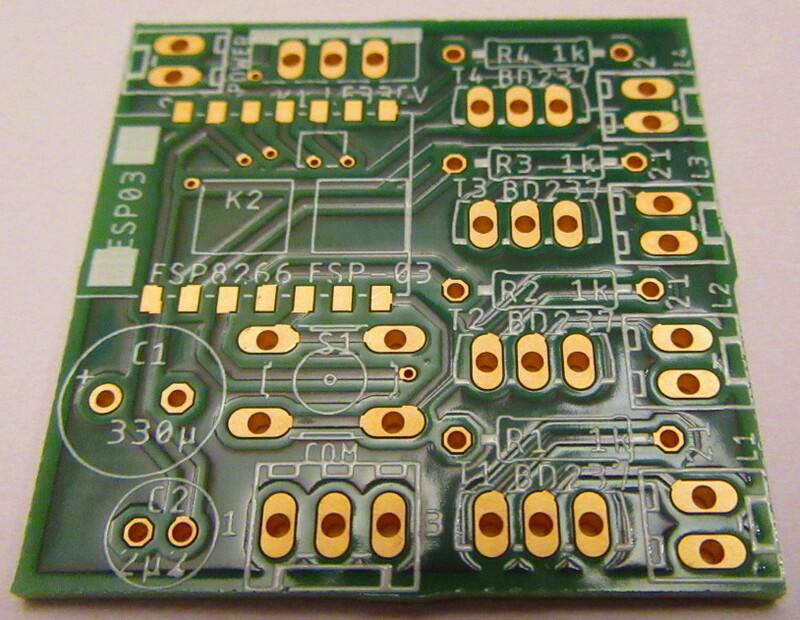 With all the parts soldered on the PCB it looks like this. #define mqtt_server_fingerprint ".. .. .. .. .. .. .. .. .. .. .. .. .. .. .. .. .. .. .. .."
With the help of a JTAG adapter, OpenOCD and Eclipse it’s possible to do on chip debugging on an ESP32. In the following chapters I’ll describe how to do that with the following hard- and software. In theory it’s possible to program the flash memory also over JTAG but currently that’s not supported by the ESP32 OpenOCD driver. See also So we need an extra USB to Serial adapter. The Olimex ARM-USB-OCD-H JTAG adapter has also an extra RS232 port, but this port doesn’t provide 3.3 volt signals. I’ve prepare a ready to use Virtual Box appliance for download. If you wouldn’t install all the software by yourself you can download the appliance. But be warned that’s a 3.23 GB download. You can easily import this appliance into Virtual Box. The user account is esp32 with password esp32. I’ve also installed the VirtualBox 5.1.14 Oracle VM VirtualBox Extension Pack. After installing Ubuntu with the default settings I’ve installed the Virtual Box Guest Additions and activated the bidirectional clipboard. I also activated the USB-2.0-Controller in the settings for the Linux guest OS. After that I could do the make menuconfig from step 4. I left all settings untouched, saved the configuration, exited menuconfig and executed the make command. I also copied the file ~/openocd-esp32/contrib/99-openocd.rules into the /etc/udev/rules.d directory. After unpacking the Eclipse installer package into ~/eclipse-installer I’ve started the eclipse-inst and installed the Eclipse IDE for C++ Developers into the default directory. With this configuration you will always break at the first available instruction. After that test I disconnected putty. If the ESP-WROOM-32 is in download mode you simply build the „flash“ target in Eclipse and wait until the download of the template app into the ESP32 flash is done. After that you can reset the ESP32 and see that you LED is blinking. In Eclipse you can choose now Run => Debug Configurations…, select under GDB OpenOCD Debugging the app-template configuration and click Debug. If all is working fine you LED stops blinking and you will break in ipc.c:ipc_task. That’s the fist code that’s executed after booting. Now you can press F8 and stop in app_main. After my first steps with the ESP8266 I got far beyond a hello world application. I’ve replaced my old self-made water level gauge with a new self-made one powered by an ESP8266 SoC. The old one have an ultrasonic sensor that sits in my cistern. The sensor was driven by an AT89C4051 micro controller with also controls a big 4-digit 7-segment display. The new one has also the same HC-SR04 ultrasonic sensor that sits in the cistern. The measurement of the water level is now driven by the ESP8266. But the water level is now send via my router to the internet platform Thingspeak. I’ve a channel in Thingspeak where I can record the measured values. I’ve started my development with the esp-open-sdk build environment on top of an ubuntu 15.04 server. After I got the blink example running I’ve ported my already existing c code for measuring the water level from the AT89C4051 to the ESP8266. That was the easiest task. Next I integrated the esphttpclient from Martin d’Allens into my project. Thanks Martin for the nice piece of code. After that I could measure and post the values to Thingspeak. But I’d a big problem. The current consumption. I would power the my Internet-of-Things device by solar energy. 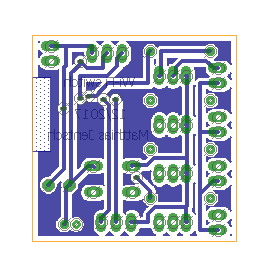 So I connected the two pads on the PCB to get the deep sleep feature running. The device is now powered by a cheap solar accu pack. Most of the time the device is sleeping. I wakes up regular with Wi-Fi modem deactivated to save power. Then it measured the water level and compares the values with the last measurement. If the measured value has not changed too much then the data should not be posted to save power. But after a configurable time span the data will always posted, even if not changed. That brings me to the next point: the configuration. At the beginning I’d all parameters hard-coded. But I would configure the device via Wi-Fi. I the device is running (not sleeping) I can press the button for at least two seconds to enter the configuration mode. 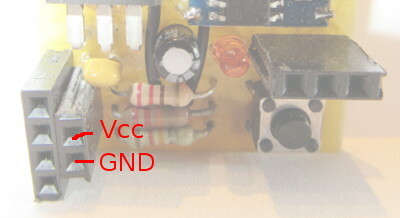 The module signals the configuration mode by blinking slowly with the LED. 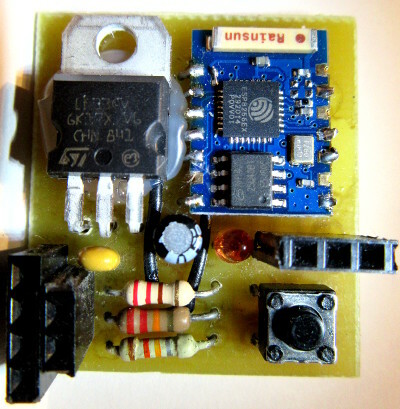 In configuration mode the ESP8266 is in SoftAP mode with a fixed SSID and a fixed password. It has a fixed IP address and opens a fixed TCP server port. Now a smart phone can send the configuration data as JSON to this port. I use the free of charge Android app TCP client for the configuration. After the ESP8266 has received the configuration it starts with measurement and sending the data to Thingspeak. I’ve released the source code under the MIT License on github. The binaries for the version 0.1 for the 512KB flash version only can be found also on github. Place a HC-SR04 ultrasonic sensor in your cistern. 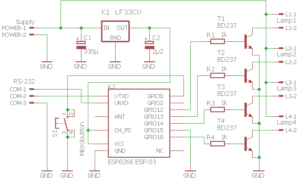 Build a connection cable between the ultrasonic sensor and the 4-pin header. Be warned: Don’t plug the HC-SR04 directly into the 4-pin header. The pin assignment doesn’t match! You need also a cable from your solar accu pack to the 2-pin header. And for downloading the firmware to the ESP8266 you need a cable for the 3-pin header for the serial port. 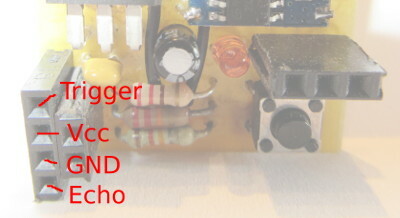 Most people use a USB to serial converter like the FTDI232 to connect the module to the PC. See the pictures below to find the correct pin assignments. For flashing the firmware into the ESP8266 I suggest the orignal tool from Espressif the manufacturer of the ESP8266 chip. You need to flash the two files from github (0x00000.bin and 0x10000.bin) and the files esp_init_data_default.bin and blank.bin from the bin directory of the Espressif SDK 1.5.2. Start the flash download tool, select the four files for download, adjust your com port and set the download speed. I suggest a baud rate of 115200. 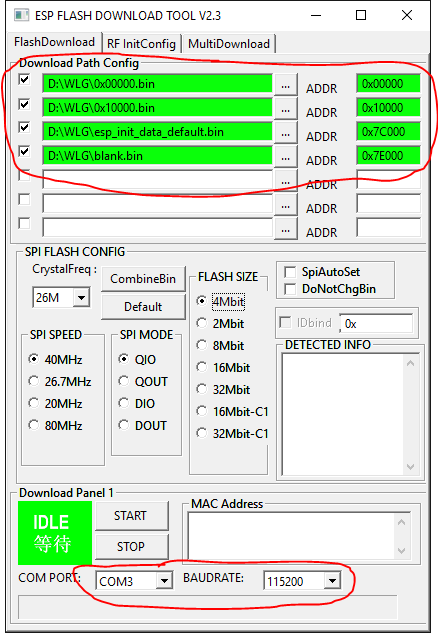 The SPI FLASH CONFIG group must not be changed. The flash will be auto detected. 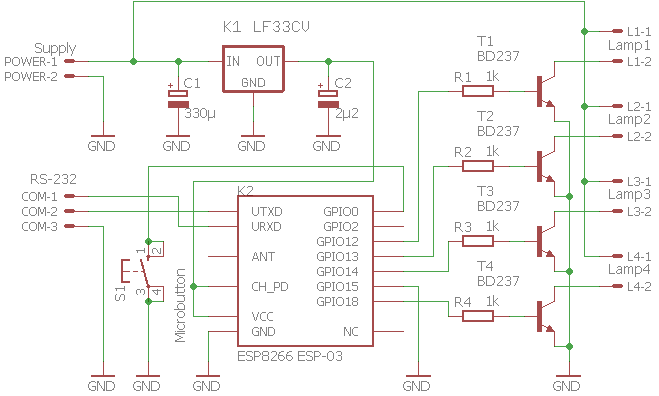 Connect the water level module via the 3-pin header to your USB-to-serial converter and the converter to the PC. 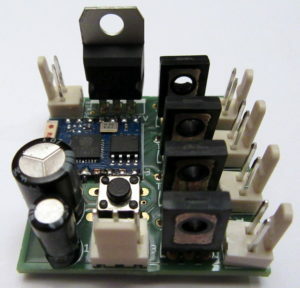 Connect the 5V power from the solar accu pack to the 2-pin header. Consider the polarity! The download should start immediately. Maybe you need to practice this a few times because it must be done in a few seconds. After the download starts you can release the micro button. The download lasts a few seconds. If it’s finished with success disconnect power, close the download tool and open a serial terminal like Putty or CoolTerm. Adjust the COM port, set the baud rate to 74880 and open/connect the COM port. Then power the water level gauge module on. in the terminal window you can start with the configuration of your module. After flashing the four files the module goes automatically into the configuration mode because it doesn’t find a configuration. You can also enter the configuration mode manually after powering the module on. To enter the configuration mode power the module on, let the LED flash one time, press the micro button for at least to seconds and the release the micro button. If the module has entered the configuration mode the LED will blink slowly. The configuration is done by sending a JSON data string via TCP/IP connection to the port where the module is listening. You can send the JSON data via smart phone. I use the free of charge Android app TCP client for the configuration. But it’s up to you, what way you choose to send the data. You need only a Wi-Fi enabled device that’s capable to connect via WPA2 to the Wi-Fi access point, connect to the TCP server socket and send the data string. Simply connect the Wi-Fi of your smart phone or similar device to the access point „WaterLevelGauge“ that the module provide. For the Wi-Fi connection you need the password „IoT-Wlg!4711#“. In the TCP client app or similar tool you need to connect to the IP 192.168.4.1 port 1253. Adjust all the settings in the example to your needs. SSID: The SSID (the display name) of the router. If the measurement should be posted to Thingspeak the module connects to this router. DeepSleepPeriod: The time span in seconds between two measurements. During this time the module consumes low current. If you have problems during the operation of the Wi-Fi water level gauge and you can’t connect a PC via serial connection you have the option to send all the messages that are output to the serial connection via TCP/IP to a program that logs the messages. I’ve written a short C# console program that receives the log and writes it to a file. // Read the data stream from the client. 2 = Send log via encrypted TLS TCP/IP connection. Maybe this feature is not currently working! 22. 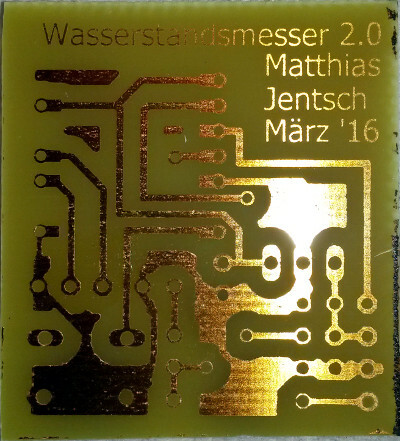 März 2016 24. April 2016 Matthias JentschComments are off for this post. At my birthday I got a „special“ present from my friends. A screwdriver on which are two 1.5 volt batteries are taped on it. That symbolic „electrical screwdriver“ was decorated with some 5 euro banknotes from which I should buy an electrical screwdriver. After thinking about the screwdriver with the two batteries an idea come into my mind. I can tape a led and a Atmel AVR microcontroller on this present and the led can blink a morse code message. I locked at the morse code wikipage and found how the morse code alphabet is coded. So I soldered an ATTiny85 with a 51 Ohm resistor and a red led together an wrote the following program. * The program let a led blink on PB3 to form a morse code. The fixed message will be send. In the _message variable I programmed a special greetings message for my friend. At christmas I gave this morse code blinkig led pen as a present back to my friend. They were really amazed about the present. 28. Dezember 2014 28. Dezember 2014 Matthias JentschComments are off for this post. Some days ago I was inspired by the blog entry Periodic Execution in .NET. I found it great to have a mechanism to periodically do some work but have also the possibility to do some work when my method gets alerted. I was thinking of a mechanism where a method (like DoSomeWork) get’s called after a period of time. But I don’t want it call after each x seconds. I want to call it once, do the work and when all lights are green I want to schedule the method call again. So in general any sort of timer would not be the best option. I would give the ThreadPool.RegisterWaitForSingleObject a try. In my scenario I’ve multiple worker. So each worker registers it own DoSomeWork method. But I would also shutdown all workers graecefully from an external method. I decided to use a CancellationTokenSource for shutdown all workers with one signal. I use the CancellationTokenSource.Token.WaitHandle as the waitobject for the ThreadPool.RegisterWaitForSingleObject call. And now when the external method decided to shutdown all workers it must only call the Cancel method on the CancellationTokenSource to signal all workers that they should finish there work and should not schedule another call to there DoSomeWork method. 10. Dezember 2014 23. Dezember 2014 Matthias JentschComments are off for this post.